Where Can You Bring a Personal Injury Lawsuit? Accidents happen and we do not have any control over their circumstances, including the location where they occur. You might be injured while passing through or spending significant time in a state other than the one you live in. If you are, you might become worried that it will be difficult to recover for your injuries or that you may be unable to recover at all. This is not the case, as you can sue to recover for personal injuries in a variety of states, depending upon the circumstances of your case. In order for a court to hear a particular case, it must have jurisdiction. There are two types of jurisdiction and both are required. Subject matter jurisdiction relates to the type of case being brought. For example, a family court can only hear certain cases that relate to domestic relations. The subject matter jurisdiction of a court is decided by statute. Personal jurisdiction is the courts ability to decide a case on behalf of a particular party. 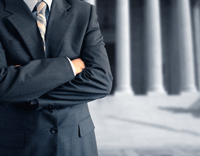 Usually, personal jurisdiction rules are examined in relation to a defendant. For the most part, if the defendant that caused your injuries resides in or does business in a particular state, you can bring a lawsuit in that state. When the defendant does not do business in or reside in the state where you want to bring a lawsuit, the rules become a bit more complex. A lawsuit can be brought in any state where service of process was affected. This means that as long as the person was served with the requisite legal paperwork in the state, the lawsuit can be brought there. Also, simply put, a defendant can be sued in any state where they have a reasonable amount of contacts. This is decided on a case by case basis, but, the general theory is that if a defendant could have reasonably known that they may be sued in a particular state, the suit can be brought there. Many personal injury actions result from automobile accidents of some kind. Each state has a statute granting it jurisdiction to decide suits stemming from automobile accidents that occur on their roads. When you drive in a particular state, you are consenting to be subject to a lawsuit there should you be involved in an accident. These motorist statutes are often utilized by personal injury attorneys. The rules relating to where a lawsuit can be brought can be complicated and difficult to understand. If you were injured and are concerned about where to bring a lawsuit, contact us for a case evaluation today.